The collection transferred to the University Archives in February 1991 from the Office of the Executive Vice- President. The Committee Records (Series I), the Administration material (Series II), and the computer disks that record administrative matters (in Series IV) are to be closed for 25 years from 1990; the rest of the collection is open to the public. The collection is organized into the following five series: I. Committee Records, 1986-1990; II. Administration, 1940-1993; III. Events and Activities, 1988-1990; IV. Audio-video Cassettes, Photographs, and Computer Disks, 1988-1990; V. Scrapbook and Artifacts, 1989-1990. Every series has been arranged alphabetically. The University of Pennsylvania celebrated its 250th anniversary in 1990. As early as 1986, University leaders began to discuss plans for the celebration. In October 1987, a commission was formally set up to start the project. Dr. Martin Meyerson, co-chairman of the Commission and former President of the University, played an important role in working out a strategic framework for the anniversary celebration. The Commission functioned through various committees and its staff, which worked from April to December 1988 under the co-directors Mary C. Carroll and ALice B. Lonsdorff, and after the reorganization of the celebration structure in late 1988, under the managing director Clare Wofford through the end of the celebration project. Also as a result of the reorganization, the managing director became a member of the newly-established Core Committee and Steering Committee, both under the Executive Committee of the Anniversary Commission. The 250th anniversary celebration continued throughout the year 1990. 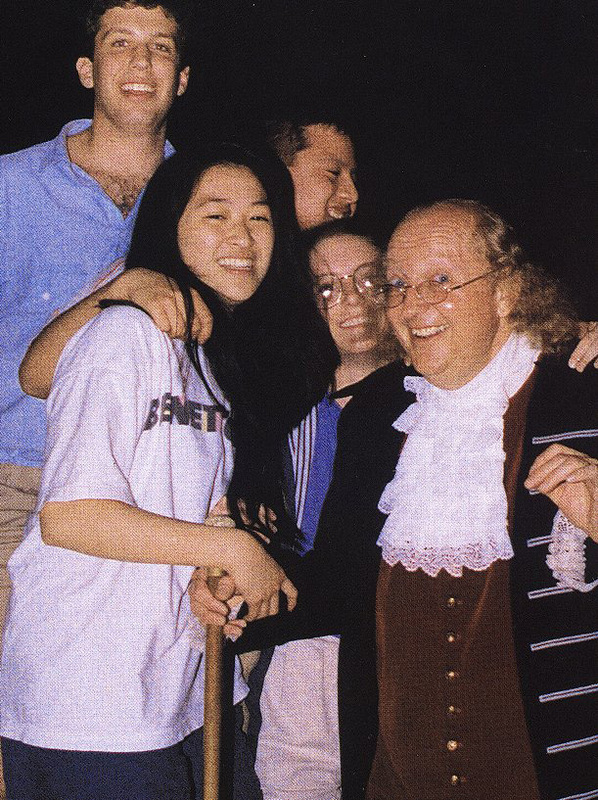 Its first events were held on January 17–Benjamin Franklin’s birthday, Penn’s traditional Founder’s Day. During the spring semester, various schools and student groups of the University sponsored presentations, lectures, and seminars in commemoration of the anniversary. The celebration reached the peak in the week from May 13 to May 20. Five major events stood out in the week: University Commencement, with First Lady Barbara Bush as the keynote speaker; three days of Plenary Sessions featuring speeches by leading public figures, including former United States President Ronald Reagan; an international colloquia, entitled “World Without Walls,” sponsored by Ted Koppel and panelled by former U.S. Secretary of State Henry Kissinger and Singaporean Prime Minister Lee Kuan Yew among others; dozens of alumni/faculty/student “Exchanges” covering major topics in practically all areas of human endeavor; and a grand cultural entertainment program featuring Dolly Parton, Bill Cosby, and Kenny Rogers. The Fall Festival included a Homecoming, a Centennial Exhibit of the Graduate School of Fine Arts, musical and theatrical performances, and two major symposiums. December witnessed a magnificent Holiday Party on the College Green. The year-long celebration closed on January 24, 1991, with a titled lecture in honor of Penn’s 250th anniversary arranged by the American Philosophical Society. The collection documents in rich detail all anniversary events which present a kaleidoscopic view of the University life, its past as well as its present. The series of Committee Records consists of meeting records and correspondence of the anniversary commission and various committees, the latter of which include the Executive Committee, the Steering Committee, the Core Committee, the Student Committee, and the Working Staff Committee. The Administration series comprises administrative files related to anniversary preparations and various aspects of the celebration activities. Included in this series are correspondence of Martin Meyerson, Chairman of the anniversary commission who initiated many of the strategic ideas for the celebration; news clippings; artistically-designed programs and brochures promoting the University’s image as America’s first university as well as its international status; correspondence of public relations; registration files; and financial material. The Events and Activities series documents all major activities held during the 250th anniversary year. The events include a Cultural Entertainment Program, exchanges among alumni, faculty and students, Fall Festival, Founder’s Day, Holiday Day, International Colloquia, Peak Week, Plenary Sessions, souvenirs, student events, and a University gift to the city. The audio-visual material and computer disk series consists of thirty-six video cassettes, nine audio cassettes, three photographs, and eighteen computer disks. The video cassettes present a rich and colorful documentation of the highlights of the year-long celebration activities. Of the thirty-six cassettes, twenty-two are original and fourteen duplicates. The twenty-two original cassettes can be further divided into two groups. Eight are of general coverage, of which one is an overview; six a detailed coverage of all highlights of the year; another one a summary version based on the full-length coverage. The remaining fourteen are on specific aspects or themes, which include the international colloquia of “World Without Walls,” student sessions, student life on campus, class reunions, women’s experience at Penn, a seminar of lesbian, gay and bisexual students, and footage of the 1940 celebration of the University’s 200th anniversary which has recorded valuable scenes of FDR’s speech on the occasion. The audio cassettes are of the two symposiums held in fall on campus, one on the purposes and prospects of universities, the other on molecular biology chaired by the Penn Nobel laureate Baruch Blumberg. The computer disks record some administrative activities of either the anniversary commission or the 250th Office. The Scrapbook and Artifacts series includes a huge scrapbook holding news clippings from August 1989 to December 1990, commemorative pins of two designs both in honor of Benjamin Franklin, three inflatable kites, three design drawings of Penn in the 21st century, and two drawings of the anniversary celebration by a New York freelance illustrator Peter T. Wadsworth. Universities and colleges–Alumni and alumnae.